We’d love your help. Let us know what’s wrong with this preview of Toward An Anthropological Theory of Value by David Graeber. This innovative book is the first comprehensive synthesis of economic, political, and cultural theories of value. David Graeber reexamines a century of anthropological thought about value and exchange, in large measure to find a way out of quandaries in current social theory, which have become critical at the present moment of ideological collapse in the face of Neoliberal This innovative book is the first comprehensive synthesis of economic, political, and cultural theories of value. David Graeber reexamines a century of anthropological thought about value and exchange, in large measure to find a way out of quandaries in current social theory, which have become critical at the present moment of ideological collapse in the face of Neoliberalism. Rooted in an engaged, dynamic realism, Graeber argues that projects of cultural comparison are in a sense necessarily revolutionary projects: He attempts to synthesize the best insights of Karl Marx and Marcel Mauss, arguing that these figures represent two extreme, but ultimately complementary, possibilities in the shape such a project might take. Graeber breathes new life into the classic anthropological texts on exchange, value, and economy. He rethinks the cases of Iroquois wampum, Pacific kula exchanges, and the Kwakiutl potlatch within the flow of world historical processes, and recasts value as a model of human meaning-making, which far exceeds rationalist/reductive economist paradigms. To ask other readers questions about Toward An Anthropological Theory of Value, please sign up. Interesting book. It's mostly pretty readable - more so than most academic books, although there are some difficult parts - although it's definitely focused towards a somewhat more academic audience and you'll have problems unless you understand some basic anthropological concepts. I like his talk about focusing on actions and potentials creating a society rather than the common idea of seeing rules that get put into practise with a clear separation between the two. His more typical anthropologi Interesting book. It's mostly pretty readable - more so than most academic books, although there are some difficult parts - although it's definitely focused towards a somewhat more academic audience and you'll have problems unless you understand some basic anthropological concepts. I like his talk about focusing on actions and potentials creating a society rather than the common idea of seeing rules that get put into practise with a clear separation between the two. His more typical anthropological discussions are fascinating. Pointing out that market ideology prioritises individual consumption as the only pleasure when almost all pleasures are really social (for example love, friendship) is important to show how market ideology is a poor understanding of "human nature". The idea of separation between external visible power - a representation of how you want to be treated based on how people have treated you in the past - and internal invisible power - the capacity for action based on internal powers - is interesting and useful. There's lots of individual interesting stuff. However, he sort of doesn't really have a conclusion or summation of what he's been saying anywhere. I understood some points he was making but I felt a bit confused as to what he really wanted the take away points to be and how exactly he wanted to improve discourse around value. The ending just sort of peters out. I didn't really feel like I got a coherent set of ideas, more like lots of stuff that's kind of separate. I mean that's obviously still worthwhile, just a bit frustrating cause I feel it could have been improved with another 10 pages focusing as a retrospective and linkage. This is a book that could not be interesting or comprehensible in its entirety to more than about a thousand professional anthropologists and economic philosophers. Even for the trained and interested reader, this book presents a challenge to the attention span. The problem is not entirely in the authoring; the writing is crisp, confident and witty, and the author devoted much apparent effort into not losing his readers even in the course of threading subtle arguments that required the inclusion This is a book that could not be interesting or comprehensible in its entirety to more than about a thousand professional anthropologists and economic philosophers. Even for the trained and interested reader, this book presents a challenge to the attention span. The problem is not entirely in the authoring; the writing is crisp, confident and witty, and the author devoted much apparent effort into not losing his readers even in the course of threading subtle arguments that required the inclusion of considerable background knowledge. The largest share of fault should be given the publisher, who ought to have invested in serious editing to ensure that a book with such intellectual merits not be crushed under the weight of often unnecessary detail and serpentine complexity. That's not how academic publishing works, unfortunately. Still mulling over the impact of this book. Unlike most important anthro books these days, Graeber writes with clarity and wit in a language that people might actually speak to each other. Graeber is post-postmodern in the sense that he is all about building grand narratives if in a more critical and measured way than most. The intial review of recent exchange theory is helpful and his rereading of Mauss as a political thinker both simultaneously helped me put into words what always bugged me ab Still mulling over the impact of this book. Unlike most important anthro books these days, Graeber writes with clarity and wit in a language that people might actually speak to each other. Graeber is post-postmodern in the sense that he is all about building grand narratives if in a more critical and measured way than most. The intial review of recent exchange theory is helpful and his rereading of Mauss as a political thinker both simultaneously helped me put into words what always bugged me about The Gift and is a tour de force well tour of Kwakiutl and Maori symbolic universes. While I usually hate looking to the ancient greeks to explain things once and for all, his contrast of Parmenidian (and Platonic) in essence categorical positivism and Heraclitian process/action/pattern theories of self and society puts this contrast in a frame which western philosophy heads (those fuckers) might actually get. And there are some choice Foucault disses as well. I get a lot of energy from reading Graeber. I find him curious, playful, well-read, open and a very original thinker. In his writing, including this book, I find there's some kind of truth bomb every 10 pages or so. I'm still processing The False Coin of Our Own Dreams. In fact I have it on my pile to re-read. I'm not a professional anthropologist, but I like his central question -- is there any way to measure value across cultures? -- as well as the conversation of ideas he generates from some i I get a lot of energy from reading Graeber. I find him curious, playful, well-read, open and a very original thinker. In his writing, including this book, I find there's some kind of truth bomb every 10 pages or so. 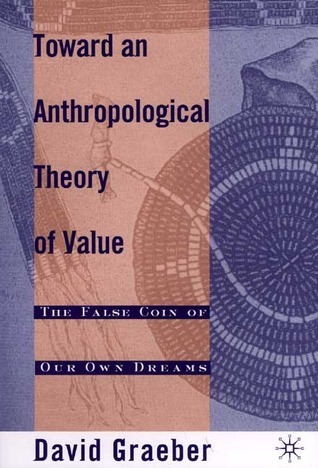 A commendable attempt to define value according to anthropology. Unfortunately the conclusion leaves one wanting more as no set definition or theory of value is established, but considering the title, one should not be too disappointed. Después de haber leído algunos de sus ensayos más recientes, y especialmente Debt, the first 5,000 years, las reflexiones de Graeber en este libro resultan algo desordenadas. El primer capítulo sugiere una contrastación entre las axiologías filosóficas y las reflexiones antropológicas sobre el valor (dispersas y asistemáticas, estas últimas), pero el resto del texto desaprovecha esa oportunidad perdiéndose en episodios interesantes, pero ya agotadísimos para cualquier antropólogo: el ensayo del Después de haber leído algunos de sus ensayos más recientes, y especialmente Debt, the first 5,000 years, las reflexiones de Graeber en este libro resultan algo desordenadas. El primer capítulo sugiere una contrastación entre las axiologías filosóficas y las reflexiones antropológicas sobre el valor (dispersas y asistemáticas, estas últimas), pero el resto del texto desaprovecha esa oportunidad perdiéndose en episodios interesantes, pero ya agotadísimos para cualquier antropólogo: el ensayo del don y la noción del hau, la disputa entre formalistas, sustantivistas y neomarxistas, etc. I am not the target audience for this book. I would have gotten a lot more out of it if I was a) an anthropologist, and b) more familiar with primary source material such a Mauss and Marx. Not that he doesn't explain them, it's just a lot to take in on a first pass. It's more detailed that what I needed, but still plenty of interesting (technical) stuff about why different societies want different things and what might unify them. I actually haven't read this whole book yet. After I read The Gift by Hyde, I decided to get this book and read what Graebar had to say about Maus. So far I have only read the chapters on gift giving. Interesting synthesis of Marx and Mauss. More soon. Good book. I feel like it's fairly important, and I'd like to re-read it. Excellent, but a pity it's not more informed by the anarchist tradition -- Graeber reinvents the wheel a few times. He was an associate professor of anthropology at Yale University, although Yale controversially declined to rehire him, and his te David Rolfe Graeber is an American anthropologist and anarchist.